I'm excited to hear some positive feedback on my new designs - and a sale already! I also got two new testimonial quotes over the past few days. "I just received my new earrings! They are waaaay prettier than I could ever have imagined and they are just the perfect size too! The pics didn’t do them justice! Thanks so much! I am already eyeing up another pair on your site and the coupon I received with my order is just the icing on the cake!" "I just saw your ad via Facebook and I had to check out your site. Being a long-time jewelery lover/obsessor, I have to say, I love your designs. They are very timeless but with a modern twist that adds unique individuality to each piece." Thanks for the kind words ladies! It is so refreshing to meet an individual like Summer Rayne Oakes (not that I've officially met her - yet!). Talk about a role model. Summer was studying environmental science, and decided to launch her career as a values-based, cause-related model smashing two or three stereotypes with her career choice right there! Sustainable Style: Talking Green with Summer Rayne Oakes from Payless Videos on Vimeo. Summer is coming to Vancouver in a few days for the Epic Expo. She will be speaking about sustainable fashion, and I've contacted her publicist to get Summer wearing ecocessories jewelry during this event! What do you think - leave your comments below. Isn't Summer Rayne Oakes the best spokesperson ever? Mother's Day is fast approaching, and I can't think of a better gift for your mom than handmade, one of a kind jewelry! ecocessories designs are loved for the simple, timeless eco style they offer. You surely can find something in the shop that will suit your mom. You could even shop online and have the package shipped directly to Mom. Email me a note with your order, and I'll gift wrap the jewelry for you! 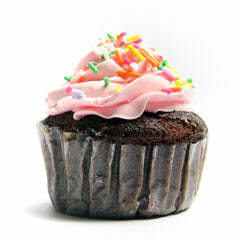 For orders placed before Tuesday, May 5, 2009 you'll get a FREE gift with your purchase! More details here. And if you can't decide? Get her a gift certificate instead! Gift certificates can be purchased online, then printed and tucked in a card to give to your mom on Sunday, May 10, 2009. Or, if you are at a distance from you mom, you can have the gift certificate emailed straight to her. Moms love handmade gifts. Make her feel special with one of a kind jewelry from ecocessories. I've just finished posting a handful of new designs! Let me know what you think of the new jewelry - whether you are shopping or browsing, I'd love to hear from you. I'm getting into the groove of operating ecocessories full time, and am focusing on spreading the word about recycled jewelry and my sustainable jewelry designs. Look forward to more regular updates to the shop and blog, and I'd love to have you as a fan on the Facebook Page! "Purple Pearl Earrings" - Buy now! "Purple Passion Necklace" - Buy now! "Central Park Earrings" - Buy now! "New York Skies Necklace" - Buy now! Please comment below to let me know how you like these designs! And this is just 4 of the set - see the whole collection of my newest items here. I'm listening to this band I just discovered. I've only just heard some music on their blog, but I like this song and I think it would be easy to design to! It's acoustic rock, and they are Vancouver locals, mojave. "mojave loves the planet. so obviously we didn’t let being in the studio stop us from participating in earth hour. it is the perfect setting too, at catherine north studio’s (which is an old church in hamilton, ontario), lit by candles. we played our song lights out in honour of the occasion." I'd love to hear what you've been listening to lately. Leave a comment below! Recycled Jewelry - Your Junk is My Inspiration! I'm getting into the groove of working on ecocessories full time. The Biz Tips over at the Modish Blog are really helping me out, as is Etsy's blog. Over there, other artists are reporting that they've quit their day jobs and couldn't be happier. Me too! There is so much support online for independent artists making a living from their craft. One thing I've learned (after a painful day of getting my accounting records straight yesterday) is that I must stay on top of things as soon as they happen! So in that regard, I received some recycled jewelry over the past month, and I decided to do a photo journal of the recycling process. The album is over on Facebook, and I invite you to come check it out. And while you are there, please become a fan! If you're online reading this, chances are you're on Facebook and as I grow into this business I'll be using my social networks to spread DIY projects from ecocessories and news about recycling jewelry. Happy 1st Birthday to ecocessories! I am so excited to wish Happy Birthday to my 1 year old company. A year ago it was Earth Week. I'd made a pledge to sustainability and had converted most of my household products and produce to organic. I was hyped up on sustainability! We were out and about in Vancouver and visited a sustainability expo. Afterward the idea seemed to just hurtle towards me. 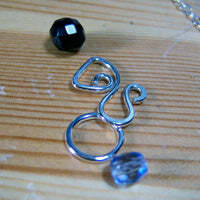 I had always been interested in designing jewelry, and wouldn't it be cool if I used recycled beads? I could be eco and fashionable at the same time. 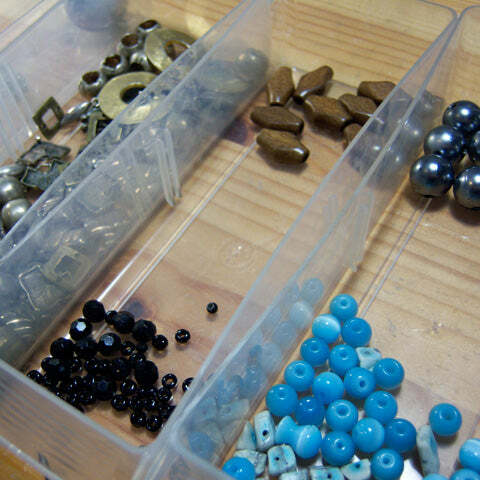 I'd be at the mercy of my materials - I don't always have the perfect blue bead, but it makes designing exciting. Especially as word about my mission to recycle jewelry had spread and my collection of recycled beads has grown! People seem to get my idea right away, which is exciting. You might have it - old, broken, out of fashion jewelry. You like it a lot, but you just don't wear it anymore. It seems a shame to throw away perfectly good materials... Recycling jewelry is just like anything else you recycle. You hate to see the material go to waste, and here is an opportunity to see the beads go to a greater purpose! It's been an exciting year of website launches, and relaunches, press releases, silversmithing, custom designs, weekend knitting, business plans, doubts and successes. I'm focused on growing ecocessories full time now, so please get involved with the community to stay involved! See the right sidebar to join me on Facebook, Twitter, Flickr, E-newsletters, or RSS. You'll get insider info about my designs, interesting do-it-yourself projects and ideas, and exclusive discounts for my supporters! P.S. For 3 Days Only - 20% everything in my shop. Enter coupon code "firstbirthday" at checkout! I just read a great article by one of my favourite publications, Granville Online. Yes I love them because they featured an article on ecocessories, but also because they have such fabulous ideas and content! Today I heard about the eco-fashion swap held at Granville Online. Women from the office brought in all their unwanted clothes - everything was sorted (pants, shirts, dresses etc.) and organized. When the swap started it was every woman for herself - and everything you parted with was yours to keep - for FREE! Read the entire article by Davinia Yip here. I got thinking about how an eco-fashion swap doesn't just have to be about clothes - it can be accessories and jewelry too! I recycle jewelry because I use the recycled beads as inspiration for my new designs, and because it reduces waste in the world. I also do it to offer a solution - many women have jewelry that was great at one time, but is now out of style and adding clutter to their lives. If you can't recycle the jewelry with ecocessories for any reason, or would simply prefer seeing a perfectly good necklace or bracelet go to a deserving friend, host an eco-fashion swap! You and your friends will be thanking each other for reviving your wardrobes, de-cluttering your closets, helping the environment, and all at my favourite price point - Free! Easily Browse Handmade Jewelry in the ecocessories Shop! Navigation: Easily next through 'More Items' as you browse the necklaces, earrings, bracelets, and originals. Recycle: Once just a link in the bottom navigation, Recycle is now a more prominent tab so I can expose more people looking to recycle jewelry to my cause. Blog: I've cleaned up the side right column with a new description/picture and a link that encourages you to subscribe. "Once I heard about ecocessories, I couldn’t stop myself from constantly perusing the site and was more than excited to make my first purchase!" "I realized last minute that I had to get a gift for my roommate’s going away party. She was leaving for Korea and I had no time to prepare anything. I called ecocessories and Jessica came to the rescue!" Read more about Joyce's nervous decision and her roommate's strong reaction! Gift Certificates make it easy to choose handmade eco-fashion! Lots of times I hear that customers just love my jewelry - so much that they just can't choose! Or sometimes it is hard to know which one-of-a-kind item is the perfect gift for your recipient. 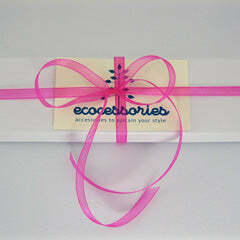 Now there is a solution with ecocessories gift certificates. Buy one for your friend's upcoming birthday, or give your mom a unique shopping experience for Mother's Day at ecocessories.ca. Available in any denomination, but I would recommend a $30+ certificate to cover a gift and shipping with insurance/tracking. Here is how it works. Click here to buy. You can email the certificate for long distance giving, or print a copy to tuck inside a card! It's that simple. Give a gift she'll really want from ecocessories.